An edible vaccine against the deadly liver disease hepatitis B may have been developed by scientists in the US. 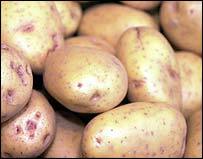 Chunks of genetically modified potato may be enough to give immunity without the need for an injection, they hope. Researchers in Buffalo, New York, found signs of immunity in 60% of the 42 people who tested the potato vaccine. An oral vaccine would be an affordable way to tackle a disease which kills 1m people a year, the Proceedings of the National Academy of Sciences reported. A hepatitis B vaccine is already available as an injection but it is too expensive for some poorer countries to buy and store in refrigerators. The relatively low cost and simplicity of an oral hepatitis B vaccine would make it ideal for global immunisation programmes, say scientists at the Roswell Park Cancer Institute in Buffalo. They took ordinary potato plants and genetically altered them to include a single protein from the hepatitis B virus. The idea was that once consumed, the protein would trigger the body's immune system to recognise and fight any future encounter with the hepatitis B virus without causing disease. The future hope is that countries could grow their own potato vaccine plants and immunise entire populations. But more research will be needed. All of the volunteers in the study had been immunised against hepatitis B with the conventional jab in the past. Dr Yasmin Thanavala and colleagues said they were confident that their prototype could lead to an oral hepatitis B vaccine. They envisage that the final version would be given in the form of a capsule or powder. Professor Graham Foster, consultant hepatologist at the Queen Mary University of London, said: "It has the potential to be terribly exciting. "A vaccine that could be grown and administered locally would have huge implications for poorer nations. "Hepatitis B is a major healthcare problem worldwide." But he said more research was needed to see whether it would work in people who had not already been vaccinated against hepatitis B. He also questioned whether the immune reaction seen in the trial was large enough to be effective in real life. "They have not cracked it yet, but it is very exciting." Hepatitis B virus is most commonly transmitted through blood-to-blood contact. Some people will suffer only an acute illness and recover quickly without any long-term liver damage. However, it can cause a chronic illness that lasts more than six months, sometimes for life, with symptoms that come and go. This can cause cirrhosis and liver cancer.